Brown logged over 2700 flight hours with 1700 in high performance military aircraft. Working 24 hours a day in two alternating shifts the crew successfully conducted approximately 80 experiments. The Laurel B. He died on his first spaceflight when the Space Shuttle Columbia (STS-107) disintegrated during orbital reentry into the Earth's atmosphere. David McDowell Brown (April 16 1956 – February 1 2003) was a United States Navy captain and a NASA astronaut. 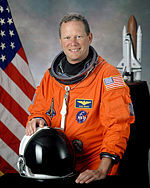 Brown became an astronaut in 1996 but had not served on a space mission prior to the Columbia disaster.